To be fair, this isn’t going to be any routine review as the subject matter or the MAN himself was way ahead of being just a writer/thinker or a master storyteller. Way ahead, because every single word he wrote in the 1940s and 50s, stands so true and relevant even in this second decade of the 21st century after more than 70 years. But before moving on to the review, with a heavy heart I have to accept that due to our own condemnable ignorance towards literature, a big majority of youngsters today are not even aware of the name Saadat Hasan Manto or his valuable works. And it’s not them, but we the elders, who are solely responsible for this mess, for not passing on the right information about our masters of the past to the next generation. Hence with an aim of rectifying the mistake, would like to share the links of three of my write-ups introducing MANTO to my younger friends that might be useful for them, especially before watching the film, which is an amalgamation of references from his life and his fictional stories, without giving any prior visual indication or any explanatory details. So if possible do read them all before watching the film as that will surely help to understand it better..
MANTO - The fearless writer, who gives you the most brutally honest & eye-opening account of Partition. TOBA TEK SINGH (Hindi-Punjabi) - An unmissable adaptation, interpretation, visualisation, expansion, amalgamation and enactment of MANTO's immortal stories by Ketan Mehta and Pankaj Kapur together. Coming to Nandita Das’s MANTO, to begin with, this is a first of its kind of biographical film in Hindi Cinema. Because, we yet haven’t seen a bio-pic made on any modern age story writer/novelist in Hindi cinema since the beginning. Yes, we have made films on creators, bhakts and saintly figures such as KALIDAS, TULSIDAS, SURDAS, KABIR and MEERA, but they were all historicals, taking us back in time to the 15th -16th century and more (also mostly featuring the poets). Among the latest ones we have MIRZA GHALIB (from the 19th century) in two versions by Sohrab Modi (as a film) and by Gulzar (as a TV serial), RANG RASIYA on the life of Raja Ravi Varma (from the 19th century) and then a film on MAJAZ (from the 20th century) made in the recent years. But again they were either poets or painter and not story/novel writers. Hence, we still had not made a biographical on any modern age story writer/playwright or novelist till Nandita Das came up with MANTO, becoming the first project on any such creator in the history of Hindi cinema and the most authentic portrayal of a writer's life post Gulzar’s MIRZA GHALIB. Secondly, giving you the actual scenario, MANTO isn’t a detailed bio-pic showcasing the complete life of its chosen figure. The film is only about MANTO’s last few years beginning from the mid-40s (just before the independence) till his death in 1952 (that happen to be his most productive years in terms of all timeless creations). So since the film intentionally focuses on this partial section of his life, it misses many significant features of his relationships within the industry, his career in Hindi cinema, his quarrels or rivalries with fellow writers and more. For instance, there was even a book of memoirs written post his demise as “Manto Mera Dushman’ by Upendernath ‘Ashq’ - one of his contemporaries. Thirdly, as a storyline, it only revolves around just three characters of Manto, his wife and his dear actor-friend Shyam. And rest all remain like cameos coming at regular intervals, which might turn out to be a concerning feature for a few who were willing to watch more of the stalwarts and their mutual interactions like Ismat Chugtai, Ashok Kumar, Nargis, Noorjehan, Sohrab Modi, Baburao Patel and others closely related with him and his career in Hindi films. To be honest, it was earlier reported that the film was mostly based on MANTO’s chapter of life spent in Bombay and in the Hindi film industry. But the presented end-product has just quick references of the same and not the expected detailing. Personally I was assuming it to be a film starting with his first project in Bombay till the day he leaves for Pakistan, sharing many rare, lesser known anecdotes related with the industry and the respective actors-writers-directors. But then, that would have obviously not featured his legendary short stories written post that phase during his last years in Pakistan. So in a way, the director is right in selecting this particular time span of his life, skillfully including the visual interpretation of many of his famous stories. As I experienced it, MANTO is more of a humane story of a legend’s inner struggle and conflict with his own personality and his art, instead of the outer world around him. But the director still makes us witness a very emotional and lovable bonding between the two dear friends who actually get parted due to a confession made in the spur of the moment (commenting upon the religion of the other) and not due to the country’s partition in specific. And this truly remains the most adorable part of the film especially for the ones who very well know about the two icons of Hindi cinema and their sensitive bonding. Winning wide appreciation in the international festival circuits, Manto actually excels more in its craft notably displayed by its highly talented team led by Nandita Das. As a director, her FIRAAQ strongly conveyed her capabilities expressively dealing with the Gujarat riots (also included in BTC’s Movies To See Before You Die list), but a biographical period drama was a completely different game having its own complexities. However, Das shiningly makes a comeback with an equally impressive film (if not better than the debut one) and delivers a gem that is sure to inspire, influence and guide the younger generation in choosing their next reads. Putting it differently, what grabs most of your attention in MANTO is its production design, recreating the era of 40s and 50s with a cleverly utilized budget, styling and execution without going overboard or being lavish. At times the nostalgic frames look exactly like the ones seen in all the vintage photographs of the past also reminding you of the art direction of the cult series TAMAS. Watch out the sequence of the night of Indian independence, conveying the important message with a minimal setup and representation. The first rate cinematography (Kartik Vijay), production design (Rita Ghosh), music (Sneha Khanwalkar) and background score (Zakir Hussain) together provide an outstanding support enhancing the overall impact of the film. And then Das, the captain of the ship, exploits all the inputs so poetically, making you feel like watching an actual footage of the gone era and not a recreated one. For instance, you must have seen the infamous black & white pictures from International LIFE magazine of an audition of two girls being taken by director A. R. Kardar in the 1950s (with girls also taking their clothes off and the director examining them). Das recreates the exact scene in her film with Manto entering in the audition being taken by a cunning director played by Rishi Kapoor. Moving at a brisk pace, the other exciting feature of MANTO is its clear references of the known celebrities (of those times) and the short appearances of all reputed artists including Rishi Kapoor, Paresh Rawal, Javed Akhtar, Ila Arun, Divya Dutta, Ranvir Shorey, Tillotama Shome, Rajshree Deshpande, Neeraj Kabi, Purab Kohli, Inaamulhaq, Madhurjeet Sarghi, Chandan Roy and Gurdas Maan. The three lead characters are played by Nawazuddin Siddique (Manto), Rasika Dugal (his wife) and Tahir Raj Bhasin (Shyam) who simply excel in their performances in that particular order. In fact Nawazuddin is never there in the film, which probably is the best compliment for an actor for his onscreen performance. Personally I always used to find more or less of Nawaz visibly present in his various characters played in the previous projects. But in MANTO he is nowhere to be found as Nawazuddin Siddique. And the same can be said about Rasika Duggal too, who subtly plays his silently suffering wife getting into the skin of her extremely difficult character. Stating a few downers, at times I did feel the film rushing at a hurried pace just touching many of the important events of his life through well-written dialogues in order to pack a lot into its less than two hours of duration, especially while dealing with the Bombay phase of Manto’s life and later in the court case. Out of all the exciting cameos, can’t say why Bhanu Uday was made to mimic instead of naturally act as Ashok Kumar. Besides, the culmination leaves you with a lot of unanswered questions about Manto’s final days and early death at the age of just 42. May be the director didn’t wish to reveal the tough times he had to face in the last years due to his excessive addiction to drinking creating critical health issues. The quick enactment of a few famous stories like ‘Khol Do’ also left me quite saddened as they couldn’t convey the shock in the desired manner despite a fine act by the veteran Gurdas Maan (in an unrecognizable get-up). 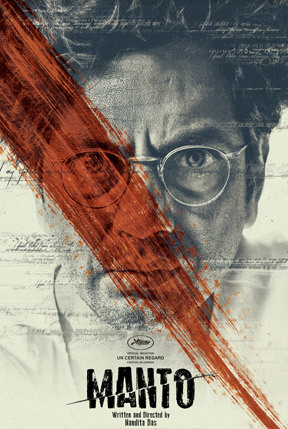 But above all, one would have to accept the truth that as a film, MANTO would honestly make more sense, forming an emotionally deep impact with only a selected section of viewers and not everyone in the theater. It will certainly appeal more to the viewers who are already well-familiar with the icon and have read his works in entirety including the short stories, plays, essays, character-sketches, letters (and not just 2-3 stories). In fact, only they would instantly be able to catch what is exactly happening on the screen and with what true reference rightly differentiating between the reality and the various short stories intelligently incorporated in the narration. The film uses references of his 6 short stories DUS RUPAYE, SAU CANDLE POWER KA BULB, MR. HAMEEDA, THANDA GOSHT, KHOL DO and TOBA TEK SINGH, beginning from its very first sequence. It will also be cherished a lot more by the ones who are well aware of Hindi film actor SHYAM, who happens to be one of the early STARS of our cinema having an enigmatic screen presence and aura in that particular time period. Informing the youngsters, Shyam is actually mentioned as a ‘could be possible threat’ to the trio of Dilip Kumar, Dev Anand and Raj Kapoor, had he been alive, in the same way as Vinod Khanna is mentioned while talking about the career of Amitabh Bachchan. Unfortunately he also died at an early age of just 31 while shooting for Filmistan’s film SHABISTAAN (after a nasty fall from a horseback). I personally feel lucky to be in touch with his nephew as one of my dear elderly friends and guides. A few well shot sequences will be thoroughly enjoyed by the friends who can easily recognize and relate to the legends shown in the film as Ismat Chugtai, Ashok Kumar, K. Asif, Naushad, Faiz Ahmed Faiz and more. Moreover, it will be truly loved by the ones who have actually read Manto’s character-sketches of the known film personalities, recalling many real life instances from his Bombay years. For example, the interesting hidden meaning behind the word ‘Hiptullah’, Manto’s experience of riots travelling with Ashok Kumar in his car, Manto and Shyam talking about Hindu-Muslim riots resulting in their separation and more are all there in the film, taken from his books “Ganje Farishtey” and “Loudspeaker” that are included in Volume 5 of Saadat Hassan Manto - DASTAVEZ (Hindi) and can also be read in STARS FROM ANOTHER SKY (English) in its different chapters. Having said that, the film is an equally important and a highly recommended must watch for the young friends, not known or aware of the phenomenon called MANTO too, as it will open new avenues for them to study further and have an incomparable experience of human psyche through his shocking, verbal and eye-opener writings. It also remains an important film for the present generation, since in all probabilities this is going to be the last opportunity for them to individually discover the master storyteller. Frankly as it seems, neither this film is going to bring in great monies for the makers nor will anyone dare to go for another take on MANTO in the future post Nandita Das’s worth praising, thoughtful attempt. So that is another solid reason why you essentially need to see it in the theaters to know and meet the only one of his kind in our vast, rich Indian-Pakistan literature – a kind that no longer exists in the present world. Sharing my personal experience, I luckily found the book of his most controversial stories (in my college days) while sitting in the room of one of my dear friend’s elder brother, who had finally settled abroad (and will be reading this too). I took the book home, read it in one night and then went completely silent for a couple of days, unable to do anything else getting severe shock of my life at the age of just 18. I used to see the characters of the stories on roads in the people around and the impact completely changed my outlook towards various elements of life especially our close relationships. However at present, with so much being forwarded one after another on social/mobile networks losing its worth and power of transforming a soul, I don’t know how much impact the film and his stories would be able to make on an over-occupied youngster in this chaotic world of excessive information. But I sincerely wish that it reaches my young friends and leaves a rock solid impact making them a much better person in their relationships and the lives ahead. Revealing more about the worth knowing storyteller, MANTO did become a divided or split personality after shifting his base to Pakistan, with one part living in the new country and the other still lying there in Bombay among his literary friends and the associates in the film industry. And you can see the glimpses of this split in the sequence of the film, when he assumes a lady to be Ismat Chugtai in the court’s lobby and asks her to take him back. Interestingly, even his two bio-pics remain divided in their portrayal made in the two neighboring countries imitating the real life. In MANTO made in Pakistan in 2015, they focused on his relationship with their icons like Noor Jehan. And in our MANTO released in 2018, we have focused on his relationships with our stars like Shyam. So even in his bio-pics the man remains divided between the two countries. Anyway, returning back to where I started, it’s a universally accepted fact that MANTO’s stories written seven decades back are equally true and relevant in the current times too in this far developed and progressed second decade of the 21st century. But can this fact be stated as any great positive feature in all honesty……..? No it cannot be……… because if his stories are even relevant today after a long period of seven decades….. then it’s a pity, a big shame for we the people, the humanity at large without any slightest of doubt. In other words, if the shocking, revealing, exposing stories written by a visionary in 1950s stand so true and relatable in the year 2018 too, then as they strongly say, it is simply “Laanat” for we all, for remaining exactly the same without any change in the last seven decades. Tab Usey Topiyon Ki Zaroorat Parhti Hai. If you miss this opportunity to know MANTO, then you will probably not get any second. Keep visiting and writing in. Thank you Bobby for your passionate review of Manto the movie by Nandita Das. I am honest to admit that, I had heard of Manto in one of your write ups. And then I began to read about him on the net. Now I must see this movie before it is removed from the screens. I will also read his books to know first hand what his writings are all about. Thank a lot Dharmakirthi for your support and I am glad my write-ups were useful enough to introduce you to one of the must read writers, who belongs to both India and Pakistan equally. Please do read more about him (I am just a msg/call away for any more assistance) and do see the film too at the earliest. I would love to have your comment in details instead of just a link shared. But anyway here is the answer for your indicative comment. Its not a film but a DOCUMENTARY/ SHORT FILM in English. VCDs of more that 50 such documentaries/short films on Indian renowned authors are availabe at Sahitya Academy center in Delhi. But they are not bio-pics of Hindi Cinema. Movie is like poetry in motion or a live painting is painted in front of you. On issue though, by bringing out the dark aspect of human tendency to forefront will resolve the issue? Its simple as your thought as your action. I certainly is a poetic piece of work.